THE TEACHERS SCHOLARS ACADEMY will grow the next generation of diverse educators that will lead the way for educational change. The program aim is to prepare the teachers who will be the backbone of school transformation, reflective thinkers who will continue to grow and develop beyond their degree. We intend that teachers who emerge from the academy will be engaged in ways that prepare students for the future. 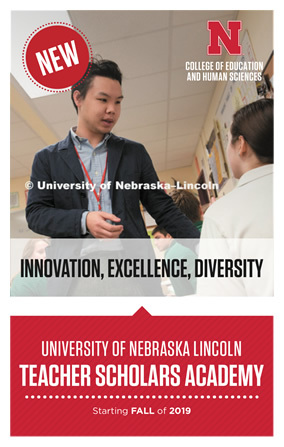 Are effective and confident in facilitating learning for all of Nebraska’s students. Can promote learning in a variety of settings using inquiry, creativity, critical thinking, and collaboration. Will, in turn, create a generation of students ready to fully participate in and lead society. Applications for the Fall of 2019 are currently closed. Up to $8,000 partial scholarship for room, board, books and fees.